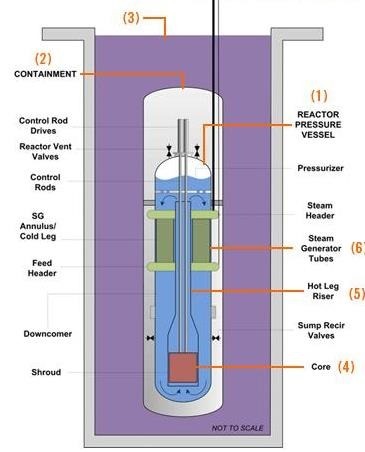 The U.S Nuclear Regulatory Commission (NRC) has told NuScale that it is satisfied that firm’s small modular reactor (SMR) design can operate safely without the need for safety-related backup electrical systems. The reactor uses passive safety features relying on convection, not pumps, to circulate water in the primary circuit. The agency determined that NuScale Power’s safety design eliminates the need for class 1E power for its small modular reactor (SMR). Class 1E is the regulatory standard set for the design of safety-related nuclear power plant electrical systems. In regulatory terms, the NRC approved NuScale Power’s “Safety Classification of Passive Nuclear Power Plant Electrical Systems” Licensing Topical Report. This document is where the company established the bases of how a design can be safe without reliance on any safety-related electrical power. NuScale’s SMR is fully passive relying on natural forces like convection and gravity instead of electrically-operated pumps to circulate coolant. This means that if necessary the reactor can shut down and cool itself for indefinite periods without the need for human intervention, water being added, or external electrical power. Currently, all nuclear plants in the U.S. are required to have class 1E power supplies to ensure safety. The NRC has limited its approval to only NuScale Power’s design. NRC’s conclusion is a key step in the review process of NuScale’s Power Module Design Certification Application (DCA). “We appreciate the NRC staff’s focused and thorough analysis of the safety and reliability our SMR design offers and for issuing their findings so early in our DCA review,” says NuScale Power Chief Operating Officer and Chief Nuclear Officer Dale Atkinson. “Our approach to safety is a first in the nuclear industry and exemplifies the inherent safety of NuScale’s SMR. This validation brings us another step closer to achieving our mission of delivering scalable advanced nuclear technology to produce the electricity, process heat, and clean water needed to improve the quality of life for people around the world”. The NRC’s review of NuScale’s DCA began March 2017 and the NRC’s final report approving the design is expected to be complete by September 2020. Once approved, certified NuScale SMRs will be available to domestic customers to be licensed for construction and operation. NuScale Power is the only company to have submitted an SMR DCA. Regulatory approval will support its first U.S. deployment by the mid 2020’s. NuScale expects the NRC to approve the reactor design by September 2020. The first commercial NuScale power plant, eventually consisting of 12 modules 50 MW linked together for a single plant installation of 600 MW, is planned to be built by NuScale and its consortium partners at the Idaho National Laboratory. It will be owned by Utah Associated Municipal Power Systems (UAMPS) and operated by utility Energy Northwest. In an interview with this blog the company responds via email to a series of questions about the NRC decision. Q: If no emergency electrical power is required, does this reduce the cost of delivering each 50 MW unit, and the time to deliver each 50 MW unit? A: Yes, because non-1E systems are considerably less expensive to purchase, operate and maintain than equivalent 1E systems. There is no expected reduction on the time to deliver each 50 MW module. Q: Does it make the technology more cost competitive for utilities? What is the order of magnitude of each – approximately? A: Yes. NuScale has not yet quantified the cost savings. Q: Does the decision speed up the overall time to complete the SER? A: The decision will not speed up the overall schedule. A: The NRC has shown flexibility with respect to NuScale’s innovative design. They are taking the time to understand the safety of the design and a willingness to accept our new approaches since we can demonstrate they are safe. Although NRC approval has not yet been obtained, other examples of NRC flexibility include control room staffing and emergency planning zone size (EPZ). Q: Overall, what is your impression of the NRC’s approach to its first review of an LWR type SMR? A: Overall, NuScale believes the NRC’s review is going well. Our extensive engagement with the NRC prior to submitting our application (over 250 meetings) laid the groundwork for an effective review by identifying and initiating work on many of the potential technical, regulatory, and policy issues associated with an innovative design. To date, we have found the NRC responsive and willing to discuss and understand our position so that issues can be successfully resolved. Q: What is the expected time frame for completing the SER and applying for a COL? A: The NRC’s current schedule is to issue the Final SER in September 2020. It appears the review is on schedule and may be slightly ahead of schedule. Our customers can submit their COL applications before our Final SER is issued. UAMPS currently plans to submit its COL application in the second quarter of 2020. Q: Does NuScale have a target date to break ground in Idaho for its customer UAMPS? A: Site mobilization is targeted for the second half of 2021. NEI added that SMRs have applications beyond utility-scale electricity generation. One 50-megawatt module can power a community of 35,000 people without needing to be connected to the national grid—a potential lifeline for isolated regions or military bases that are dependent on fossil fuel deliveries. “Small reactors are one of the most promising new nuclear technologies to emerge in decades. There is great potential for small reactors in energy markets—domestic and overseas,” Korsnick said. It can be used to desalinate water, provide process heat for industrial applications, or be integrated with intermittent renewables for a combined power plant that can provide 24/7, zero-carbon, affordable electricity. Canada and the United Kingdom have expressed interest in U.S.-designed small reactor technologies, while other countries including Argentina, China, Russia and South Korea are developing their own SMR designs, both for domestic use and export markets.